White walls are taking a backseat as Brexit, Trump and global political instability drive homeowners to "nest", according to the interior designer behind the Stockholm Furniture Fair's annual Trends exhibition. Lotta Agaton, one of Sweden's most high-profile interior stylists, centred her 2017/18 Trends exhibition on five different darkly hued rooms. She said that the current political mood was driving interest in dark interiors to create a feeling of privacy and comfort. "During recent years of stability and safety, we have had bright white spaces that are open for exposure," Agaton told Dezeen. "But in darker times when the political and economic climate get more uncertain, you want to nest a little bit." "We have more cosy environments with dark walls that feel embracing. It's like with winter and spring, but in a larger way." 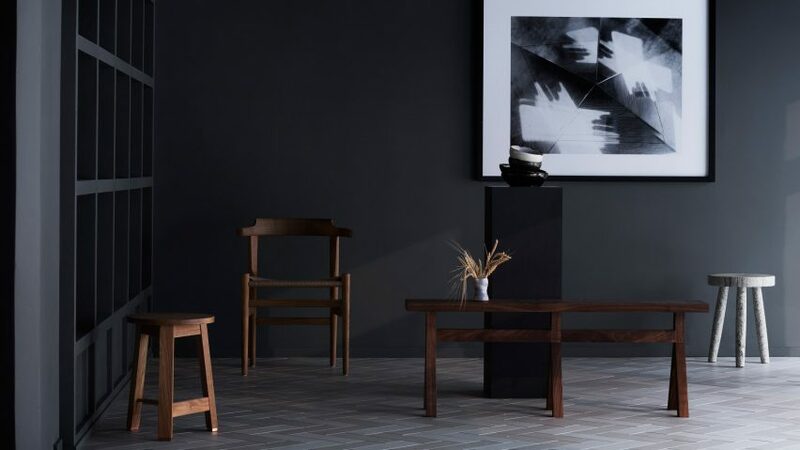 Agaton predicts that rather than black and grey, the new crop of dark interiors will focus on rich pigments, tone-on-tone and even lively colours that are a "bit more happy" and signal hope. In her Trends exhibition at the Stockholm Furniture and Light Fair, which ran from 7 to 11 February 2017, this took the form of five tone-on-tone rooms, including a dining room with grey-blue walls, cobalt floors and matching chairs. A similar approach was taken by Note Design Studio in the fair's pop-up Design Bar, a pink-on-pink Italian-Swedish restaurant where tones ran the gamut from salmon to burgundy. The studio had aimed to use colour and texture to build a space that was "warm, inspiring and generous". Pink also featured in one of Agaton's styled rooms: an office. The interior designer predicted the traditionally feminine colour could become more popular as a backlash to the hypermasculine culture surrounding Trump and his supporters. "It is interesting to think about the impact Trump will have on trends," she said. "Is it not going to be so manly? Are we going to get pink offices? I think interiors reflect those big political changes." Other interiors projects showcased during the Stockholm Design Week have embraced more sombre colours. Greyish shades of green and blue feature in both Stockholm's new co-working space Alma, designed by Tham & Videgård, and in Paris's Copenhague fine-dining restaurant, by duo GamFratesi. The latter is filled with custom-designed furniture, launched as a collection at the fair by Danish brand Gubi. Agaton said that political and social observations informed the projects she was working on now that would take years to complete. "I have a problem with the word trend," she said. "Normally what people mean is consumer trends, like what you see at the fairs." "But when you're in the industry you're planning, like, two years ahead, and that's when trends are something else, that's when it has to do with society." A similar trend away from lightness emerged at December's Design Miami, where "extreme furniture" featuring anarchic forms was linked to the tumultuous political times. Trump's election, in particular, has triggered a wave of responses from designers, ranging from protests and boycotts to satirical logos and IKEA instructions.